Romero originated in the province where the volcano is located, which was formerly itself called Chaparrastique and is now known as San Miguel. The volcano is therefore also referred as “the San Miguel volcano.” According to local belief, San Miguel was saved from a 1787 eruption of the volcano by the intercession of Our Lady Queen of Peace, who is venerated there. Romero was a life-long devotee and he cared for the statue as a priest. The Sunday morning eruption is threatening various towns and hamlets in Romero’s home province of San Miguel, as well as in another region, called Santiago de Maria, where Romero served as bishop in the 1970s, before he was appointed archbishop of El Salvador’s capital, San Salvador, located 85 miles to the west. 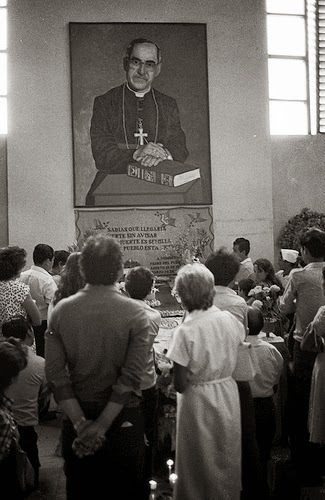 Before Romero was ordained a bishop, he served as editor of San Miguel’s diocesan newspaper—also called Chaparrastique. He served in this capacity from 1961 to 1967, a longer stretch than his term as Archbishop of San Salvador (1977-1980), for which he is much better remembered. As of Sunday night, there had been no fatalities reported and it was too early to tally material damages. Please consult Tim’s El Salvador Blog for English-language coverage of this developing story and other matters related to El Salvador. Romero proviene de la provincia donde se encuentra el volcán, provincia que anteriormente se llamó Chaparrastique y ahora se conoce como San Miguel. Por tanto, el volcán se conoce también como "el volcán de San Miguel. " Según la creencia local, San Miguel se salvó de una erupción del volcán en 1787 por la intercesión de Nuestra Señora Reina de la Paz, que se venera allí. Romero fue su devoto de toda la vida y estuvo a cargo de cuidar la imagen cuando era sacerdote. La erupción del domingo por la mañana está amenazando a varios pueblos y aldeas en la provincia natal de Romero, San Miguel, así como en otra región, llamada Santiago de María, donde Romero se desempeñó como obispo en la década de 1970, antes de ser nombrado arzobispo de la capital de El Salvador, San Salvador, que está situada 140 kilómetros al oeste. Antes de que Romero fuera ordenado obispo, fue director del semanario diocesano de San Miguel—también llamado «Chaparrastique». Se desempeñó en este cargo desde 1961 hasta 1967, un tramo más largo que su período como Arzobispo de San Salvador (1977-1980), por cual es mucho más conocido. Al domingo por la noche, no había habido fatalidades reportadas y era demasiado temprano para contabilizar daños materiales. Por favor consulte la prensa local salvadoreña para darle seguimiento al desarrollo de esta noticia. Romero è nato nella provincia in cui si trova il volcano—provincia che precedentemente si chiamava Chaparrastique ed è ora conosciuta come San Miguel. Il vulcano è quindi indicato anche come “il vulcano San Miguel”. Secondo la credenza locale, San Miguel è stato salvato da un eruzione del vulcano nel 1787 per intercessione di Nostra Signora Regina della Pace, venerata lì. Romero era un devoto per tutta la vita e ha curato la statua come un prete. L’eruzione Domenica mattina sta minacciando varie città e villaggi nella provincia natale di Romero (San Miguel), così come in un’altra regione, chiamata Santiago de Maria, dove Romero servito come vescovo nel 1970, prima di essere nominato arcivescovo della capitale di El Salvador, San Salvador, situato 140 km a ovest. Prima di Romero è stato ordinato vescovo, ha servito come direttore del quotidiano diocesano di San Miguel—anche chiamato «Chaparrastique». Ha servito in questa posizione dalla 1961-1967, un tratto più lungo del suo mandato come Arcivescovo di San Salvador (1977-1980), di cui è molto più conosciuto. A partire da Domenica sera, non c’erano stati incidenti mortali denunciati e che era troppo presto per coincidere danni materiali. Si prega di consultare la stampa locale salvadoregna o il Blog di Tim su El Salvador [inglese] di seguire lo sviluppo di questa notizia. “Let’s talk about Msgr. Romero,” Pope Francis told Salvadoran President Mauricio Funes when the two met in May (see item number 3 below). The papal directive could be used to describe the year Archbishop Óscar Romero had in 2013—it was a banner year. Talk about Archbishop Romero, we did—whether it was the Pope talking about Romero with numerous visitors to the Vatican, the friendly coverage in the official Vatican newspaper (item #9), or articles for (here and here) and against his beatification (here), the Pope’s invitation made Archbishop Romero a topic of discussion this year. And there was a lot to talk about! The following are the top ten Romero related stories we discussed this year. 1. Movement in Rome. The progress in Archbishop Romero’s canonization cause in 2013 came in three distinct movements. First, Archbishop Vincenzo Paglia, the postulator of the cause, announced that Pope Francis had unblocked the cause. Later, the Congregation for the Doctrine of the Faith announced that it had issued a «nihil obstat,» removing any doctrinal barriers to the cause. Finally, the Congregation for the Causes of Saints confirmed that there were no obstacles remaining for the beatification to proceed. Pope Francis reportedly told numerous observers that the cause is on track. 3. Pope Francis meets with President Funes. In an extraordinary development, the President of El Salvador met in the Vatican with the Pope and discussed the progress of the beatification cause. Pope Francis told Pres. Mauricio Funes that “we must have faith” that Romero will be beatified soon, and he heard words of gratitude from the President for unblocking the cause. Funes also told the Pontiff about Archbishop Romero’s importance in El Salvador and he presented the Pope with a reliquary containing a piece of Romero’s blood stained vestments the martyr bishop wore when he was killed. 4. Closure of Tutela Legal. The darkest cloud on the sunny Romero sky of 2013 was the surprising decision by the current Archbishop of San Salvador, Msgr. José Luis Escobar Alas, to close down the successor entity to the human rights office founded by Archbishop Romero. The Archdiocese’s commitment to human rights work was embodied by that office and its abrupt closure called into question whether war crime victims represented by the office would have standing to continue their lawsuits, whether the crucial documentation of war crimes kept by the office would be maintained, and whether Romero’s enormous contribution to human rights would be squandered. 5. Giant Romero painting at World Youth Day papal event. When Pope Francis went to Rio de Janeiro, Brazil, to lead the Catholic World Youth Day, he wanted to be sure to visit one of the city’s slums to show his closeness with the poor. When he got there, he found a giant poster of Archbishop Romero looming over the soccer field where the slum rally was held. The billboard was created by Salvadoran artists who had been trying to make a splash with it at World Youth Day since 2005. They did so this year. 6. St. George’s Southwark opens “Romero space”. On a late summer’s evening in September, more than 1,200 people, many of whom had made long journeys from around Britain to be present came to the Metropolitan Cathedral of St. George in Southwark (London) to inaugurate a space dedicated to Archbishop Romero and to bless a large “Romero Cross,” in the style pioneered by the Salvadoran muralist Fernando Llort, and created by the Salvadoran master in El Salvador. Ambassadors and High Commissioners, members of Parliament and other government officials, were present, as well as ecumenical representations of both the Catholic and Anglican faiths, and others, including Romero’s secretary and his younger brother who traveled from El Salvador to attend. 7. Romero statue at L.A.’s Macarthur Park. The Salvadoran community of Los Angeles inaugurated a statue of Archbishop Romero at the city’s Macarthur Park, located in a heavily Central American neighborhood, and both the mayor and the archbishop of Los Angeles were on hand for the unveiling. Archbishop José H. Gómez referred to Romero as a “great martyr” who “inspires all of us to build a better world, a world that promotes human dignity and the common good for the human family” more than thirty years after his death. Mayor Eric Garcetti told the crowd, “This is more than a monument of a man. This is a monument that salutes courage.” The statue was crafted in El Salvador and blessed at the Divine Providence Chapel where Romero was killed. 8. Cardinal Ortega at El Salvador’s Eucharistic Congress. The Archdiocese of San Salvador celebrated its centenary with a Jubilee Year, which it closed out with a Eucharistic Congress. Cuban Cardinal Jaime Ortega attended as the Pope’s representative. That he spoke in favor of Archbishop Romero’s canonization at the closing Mass was not surprising. He also visited and prayed at the cancer hospital where Romero lived, and visited his tomb underneath the Cathedral crypt. What was truly remarkable was that Romero was given a prominent spot during the Eucharistic Congress. Archbishop Romero always looked back to the last national Eucharistic Congress, held in 1942, and the social message from Pope Pius XII received for that Congress. That Romero himself would be the subject of the papal messenger at the second Eucharistic Congress shows how far he has advanced to be seen together with his nation's spiritual identity. 10. 33rd anniversary observed. As of this year, Oscar Romero has been a martyr as long as Jesus Christ was alive and the anniversary of his death was marked by local and global commemorations. At the local level, major events were held in San Salvador, London and Rome. In the eternal city, Argentine Nobel laureate Adolfo Perez Esquivel was the keynote speaker. He received an audience with Pope Francis ahead of his appearance at the event. Internationally, the Church marks March 24 as the Day of Prayer and Fasting for Missionary Martyrs and the U.N. as the International Day of the Right to Truth regarding serious violations of human rights. Finally, on this blog, we adopted «Romero for the Year of Faith» as our theme and expanded coverage to try to keep up with fast breaking canonization news. Notably, we implemented a three languages policy on Pentecost and have been posting in English, Spanish and Italian ever since, in an effort to make the blog’s content available to a large swath of the Catholic world. Other mileposts included new alliances, distribution and promotion efforts, and 100,000 page views. Look for new projects next year, including a problem we will be all too glad to have—life after beatification, for a beatification blog! “Hablemos de Monseñor Romero”, le dijo el Papa Francisco al presidente salvadoreño, Mauricio Funes, cuando los dos se reunieron en mayo (véase el punto número 3 abajo). La directiva papal podría describir el año que Mons. Óscar A. Romero ha tenido en el 2013—ha sido un año excepcional. ¡Sí!—hemos hablado sobre Mons. Romero: lo hizo el Papa con numerosos visitantes al Vaticano, se ha hecho en la cobertura del periódico oficial del Vaticano (artículo # 9) y también se ha hecho con artículos a favor y en contra de su beatificación. La postura del Papa ha hecho de Mons. Romero un tema de discusión en este año. ¡Y había mucho de qué decir! Las siguientes son las “top” diez noticias Romero que hemos comentado este año que está terminando. 1. Movimiento en Roma. El progreso en la causa de canonización de monseñor Romero en 2013 se produjo en tres movimientos distintos. Primero, el arzobispo Vincenzo Paglia, el postulador de la causa, anunció que el Papa Francisco había desbloqueado la causa. Después, la Congregación para la Doctrina de la Fe anunció que había emitido un «nihil obstat», que significa la eliminación de todas las barreras doctrinales a la causa. Por último, la Congregación para las Causas de los Santos confirmó que no había obstáculos restantes para que proceda la beatificación. El Papa Francisco ha dicho a varios visitantes de que la causa “va por buen camino”. 2. Jorge Mario Bergoglio elegido Papa. La elevación del primer latinoamericano al trono de San Pedro representa un cambio de paradigma en la Iglesia, también para la causa Romero. Como lo explican los cardenales italianos Achille Silvestrini y Andrea Cordero Lanza di Montezemolo, “Romero es el símbolo de la Iglesia que el Papa Bergoglio quiere proyectar hacia las periferias geográficas y existenciales” de este Pontificado y existe “una identidad de pensamiento” entre Mons. Romero y el nuevo el Papa, quien anunció que le gustaría ver que la Iglesia Católica sea “una Iglesia pobre y para los pobres”. 3. El Papa Francisco se reúne con el presidente Funes. En un acontecimiento extraordinario, el Presidente de El Salvador se reunió en el Vaticano con el Papa y platicó el progreso de la causa de beatificación Romero. El Papa Francisco le dijo al Pres. Mauricio Funes que hay que tener fe que Romero será beatificado pronto, y escuchó las palabras de agradecimiento del Presidente por desbloquear la causa. Funes también le platicó al Pontífice sobre la importancia de Mons. Romero en El Salvador y le presentó al Papa un relicario que contiene un corte del vestimento manchado de sangre que el obispo mártir llevaba cuando fue asesinado. 4. Cierre de Tutela Legal. La nube oscura en el cielo soleado de Romero en el 2013 fue la sorprendente decisión del actual arzobispo de San Salvador, Mons. José Luis Escobar Alas, de cerrar la entidad sucesora de la oficina de derechos humanos fundada por Mons. Romero. El compromiso de la Arquidiócesis de trabajar por los derechos humanos fue plasmado en esa oficina y su cierre abrupto pone en riesgo la habilidad de las víctimas de crímenes de guerra representadas por la oficina de continuar con sus demandas, hace peligrar la importante documentación de los crímenes de guerra que posee esa oficina, y hace dudar si la enorme contribución de Mons. Romero a los derechos humanos se desperdiciaría. 5. Pintura gigante de Romero en evento papal de la Jornada Mundial de la Juventud. Cuando el Papa Francisco fue a Río de Janeiro, Brasil, para presidir sobre la Jornada Mundial de la Juventud, quería estar seguro de visitar uno de los barrios marginales de la ciudad para mostrar su cercanía con los pobres. Cuando llegó allí, se encontró con un cartel gigante de Mons. Romero sobre el campo de fútbol donde se celebró el encuentro con los habitantes de los tugurios. La pintura fue creada por artistas salvadoreños que habían estado tratando de hacer noticia con ella en la Jornada Mundial de la Juventud desde el año 2005. Este año lo han logrado. 6. St. George Southwark abre “espacio Romero”. En una noche de verano a finales de septiembre, más de 1.200 personas, muchas de las cuales habían hecho largos viajes desde todo el Reino Unido para estar presentes, llegaron a la Catedral Metropolitana de San Jorge en Southwark (Londres) para inaugurar un espacio dedicado a Mons. Romero y bendecir una gran “Cruz Romero”, en el estilo iniciado por el muralista salvadoreño Fernando Llort, y elaborada por él en El Salvador. Embajadores y Altos Comisionados, miembros del Parlamento y otros funcionarios gubernamentales, estuvieron presentes, así como representaciones ecuménicas, tanto de las religiones católicas y anglicanas, y otros, incluyendo el secretario de Romero y su hermano menor, quienes viajaron desde El Salvador para asistir. 7. Estatua Romero en el Parque Macarthur de Los Ángeles. La comunidad salvadoreña de Los Ángeles inauguró una estatua de Mons. Romero en el Parque MacArthur de esa ciudad, situado en un barrio altamente centroamericano, y tanto el alcalde como el arzobispo de Los Angeles estuvieron presentes para la inauguración. El Arzobispo José Gómez se refirió a Romero como “el gran mártir”, que “nos inspira a todos nosotros a construir un mundo mejor, un mundo que promueva la dignidad humana y el bien común de la familia humana” más de treinta años después de su muerte. El Alcalde Eric Garcetti dijo a la multitud: “Esto es más que un monumento a un hombre. Este es un monumento que rinde homenaje a la valentía”. La estatua fue hecha a mano en El Salvador y bendecida en la Capilla Divina Providencia donde Mons. Romero fue asesinado. 8. El Cardenal Ortega en el Congreso Eucarístico de El Salvador. La Arquidiócesis de San Salvador celebró su centenario con un año jubilar, que se clausuró con un Congreso Eucarístico. El cardenal cubano Jaime Ortega asistió como representante del Papa. El hecho de que se manifestó a favor de la canonización de Mons. Romero en el cierre no fue sorprendente. También visitó y oró en el hospital de cáncer donde vivía Romero, y visitó su tumba en la cripta de la Catedral. Lo verdaderamente notable ha sido que Mons. Romero ocupó un lugar prominente durante el Congreso. Mons. Romero siempre se inspiró en el último Congreso Eucarístico Nacional, que se celebró en 1942, y el mensaje social del Papa Pío XII recibido en ese Congreso. Que el mismo Romero sea el tema del mensajero papal en el segundo Congreso Eucarístico muestra lo tanto que ha avanzado en conquistar la identidad espiritual de la nación. 9. Cobertura amistosa en L’Osservatore Romano. Como si una cita expansiva y un artículo en el diario oficial de la Iglesia no fuera suficiente, la nota sobre arzobispo Romero también fue incluida en la sección de la mujer—convirtiéndose en el primer hombre a ser así destacado. Una integrante de la redacción del periódico explicó la importacia inconfundible de la cobertura, señalando que las palabras de Mons. Romero “son similares a las que a menudo ha pronunciado el Papa Francisco en sus homilías diarias, en las que recuerda con afecto y admiración a las abuelas y madres que transmiten la vida en común y la fe a sus hijos y a sus nietos”. 10. Se observó el 33° aniversario. A partir de este año, Oscar Romero ha sido un mártir tanto tiempo como Jesucristo vivió sobre la tierra (33 años) y el aniversario de su muerte estuvo marcado por conmemoraciones locales y globales. A nivel local, se llevaron a cabo importantes eventos en San Salvador, Londres y Roma. En la ciudad eterna, el premio Nobel argentino Adolfo Pérez Esquivel fue el orador principal. Recibió una audiencia con el Papa Francisco antes de participar en el evento. A nivel internacional, la Iglesia celebra el 24 de marzo como el día de oración y ayuno por los misioneros mártires y la ONU observa el Día Internacional del Derecho a la Verdad en relación con graves violaciones a los derechos humanos. Por último, en este blog, adoptamos como lema «Romero para el Año de la fe» y ampliamos la cobertura para tratar de mantenernos al día con noticias de última hora sobre la próxima canonización. En particular, se implementó una política de tres lenguas en Pentecostés y se ha estado publicando en inglés, español e italiano, desde entonces, en un esfuerzo de hacer que el contenido del blog esté a disposición de una amplia franja del mundo católico. Otros hitos incluyen nuevas alianzas, esfuerzos de distribución y promoción, y 100.000 vistas. Espere nuevos proyectos el próximo año, incluyendo un nuevo problema para un blog sobre la beatificación que estaremos muy contentos de tener: la vida después de la beatificación. “Parliamo su Mons. Romero”, Papa Francesco ha detto al Presidente salvadoregno Mauricio Funes, quando i due si incontrarono in maggio (vedi numero di articolo 3). La direttiva papale potrebbe descrivere l’anno Mons. Óscar Romero ha avuto nel 2013, è stato un anno eccezionale. Parlare di Mons. Romero, abbiamo fatto—se sia stato il Papa parlando di Romero con numerosi visitatori del Vaticano, la copertura nel giornale ufficiale del Vaticano (item # 9), o articoli pro e contro la sua beatificazione, la posizione del Papa ha fatto Mons. Romero un argomento di discussione di quest’anno. E c’era molto di cui parlare! Di seguito sono riportate le top dieci notizie Romero che abbiamo discusso di quest’anno. 1. Movimento a Roma. Il progresso nella causa di canonizzazione di Mons. Romero nel 2013 è venuto in tre movimenti distinti. In primo luogo, Mons. Vincenzo Paglia, il postulatore della causa, ha annunciato che il Papa Francesco aveva sbloccato la causa. Successivamente, la Congregazione per la Dottrina della Fede ha annunciato di aver emesso un «nihil obstat», rimuovendo eventuali ostacoli dottrinali alla causa. Infine, la Congregazione per le Cause dei Santi ha confermato che non vi erano ostacoli rimanenti per la beatificazione di procedere. Papa Francesco ha detto numerosi osservatori che la causa è sulla buona strada. 2. Jorge Mario Bergoglio eletto papa. L’elevazione del primo latinoamericano alla Sede di Pietro ha rappresentato uno spostamento tettonico per la Chiesa, come anche per la causa Romero. Come spiegato da cardinali Achille Silvestrini e Andrea Cordero Lanza di Montezemolo, “Romero è il simbolo della Chiesa che papa Bergoglio vuole proiettata nelle periferie geografiche ed esistenziali” di questo pontificato e vi è “un idem sentire” tra l’arcivescovo Romero e il nuovo Papa, che ha annunciato che vorrebbe vedere la Chiesa cattolica come “una Chiesa povera e per i poveri”. 3. Papa Francesco incontra il Presidente Funes. In uno sviluppo straordinario, il Presidente di El Salvador si è riunito in Vaticano con il Papa e discusso lo stato di avanzamento della causa di beatificazione. Papa Francesco detto Pres. Mauricio Funes che dobbiamo avere fede che Romero sarà beatificato presto, e udì le parole di ringraziamento del presidente per sbloccare la causa. Funes ha anche parlatto il Pontefice sull’importanza di Mons. Romero in El Salvador e ha presentato al Papa un reliquiario contenente un pezzo di vestimenti di Romero macchiate di sangue che il vescovo martire indossava quando fu ucciso. 4. Chiusura della Tutela Legale. La nube scura sulla cielo soleggiato di Romero del 2013 è stata la decisione a sorpresa dal corrente arcivescovo di San Salvador, mons. José Luis Escobar Alas, a chiudere l’ente successore all’ufficio di diritti umani fondato da Mons. Romero. L’impegno di lavoro della Arcidiocesi per i diritti umani è stato incarnata da tale ufficio e la sua brusca chiusura mette a rischio se ​​vittime di crimini di guerra rappresentato dall’ufficio può continuare le loro cause, se la documentazione cruciale di crimini di guerra tenuti dall’Ufficio verrebbe mantenuta, e se l’enorme contributo di Romero per i diritti umani sarebbe sprecato. 5. Grande pittura Romero all’evento papale nella Giornata Mondiale della Gioventù. Quando Papa Francesco è andato a Rio de Janeiro, in Brasile, a guidare la Giornata Mondiale della Gioventù cattolica, voleva essere sicuro di visitare uno dei “favela” della città per dimostrare la sua vicinanza con i poveri. Quando arrivò, trovò una gigantografia di Mons. Romero che incombe sul campo di calcio dove si è tenuto il incontro con i residenti dello slum. Il cartellone è stato creato da artisti salvadoregni, che aveva cercato di fare notizie con esso in occasione della Giornata Mondiale della Gioventù dal 2005. Quest’anno lo hanno fatto. 6. San Giorgio di Southwark apre lo “spazio Romero”. Su sera di fine estate nel mese di settembre, più di 1.200 persone, molte delle quali avevano fatto lunghi viaggi intorno Gran Bretagna per essere presenti giunti alla Cattedrale Metropolitana di San Giorgio a Southwark (Londra) per inaugurare uno spazio dedicato a Mons. Romero e benedire una grande " Romero Croce ", in stile sperimentato dal muralista salvadoregno Fernando Llort, e creato per lui in El Salvador. Ambasciatori e Alti Commissari, membri del Parlamento e di altri funzionari governativi, erano presenti, così come rappresentazioni ecumenici di entrambe le fedi cattolica e anglicana, e altri, tra cui il segretario di Romero e il suo fratello minore che viaggiava da El Salvador a partecipare. 7. Statua Romero in Parco Macarthur di L.A. La comunità salvadoregna di Los Angeles ha inaugurato una statua di Mons. Romero al MacArthur Park della città, situato in una zona popolata da immigrati provenienti dall'America Centrale, e sia il sindaco e l’arcivescovo di Los Angeles sono stati a disposizione per l’inaugurazione. Mons. José H. Gómez indicato Romero come il “grande martire”, che “ci ispira tutti noi per costruire un mondo migliore, un mondo che promuove la dignità umana e il bene comune per gli umani di famiglia” più di 30 anni dopo la sua morte. Il sindaco Eric Garcetti ha detto alla folla: “Questo è più di un monumento di un uomo. Si tratta di un monumento che saluta il coraggio”. La statua è stata realizzata in El Salvador e benedetta presso la Cappella Divina Provvidenza, dove Romero è stato ucciso. 8. Il cardinale Ortega a Congresso Eucaristico di El Salvador. L’arcidiocesi di San Salvador ha celebrato il suo centenario con un anno giubilare, che ha chiuso con un Congresso Eucaristico. Il cardinale cubano Jaime Ortega ha partecipato come rappresentante del papa. Che ha parlato a favore dellacanonizzazione di Mons. Romero alla chiusura Messa non era sorprendente. Ha inoltre visitato e pregato presso l’ospedale cancro in cui Romero ha vissuto, e ha visitato la sua tomba nella cripta di Cattedrale. Quello che era veramente notevole è che Romero è stato dato un posto di primo piano durante il Congresso Eucaristico. Mons. Romero guardò sempre indietro all’ultimo Congresso Eucaristico Nazionale, tenutosi nel 1942, e il messaggio sociale di Papa Pio XII ricevuto per questo Congresso. Che Romero stesso sarebbe l’oggetto del messaggero papale al secondo Congresso Eucaristico mostra quanto egli ha avanzato a catturare l’identità spirituale della nazione. 9. Copertura amichevole in L’Osservatore Romano. Come se una citazione espansiva e uno scrito nel giornale ufficiale della Chiesa non bastasse, la nota su Mons. Romero è stato inclusa anche nella sezione delle donne—facendo di lui il primo uomo di essere presenti così. L’importaza inconfondibile della copertura è stato spiegata di un membro dello staff editoriale che ha notato che il messaggio di Romero “Sono parole vicine a quelle che pronuncia spesso Papa Francesco nelle sue omelie quotidiane, con cui ricorda con simpatia e ammirazione le nonne e le mamme che trasmettono la vita e insieme la fede ai loro figli e nipoti”. 10. Il 33 ° anniversario è osservato. Da quest’anno, Oscar Romero ha stato un martire, lo stesso tempo che Gesù visse sulla terra (33 anni) e l’anniversario della sua morte è stato segnato da commemorazioni locali e globali. A livello locale, grandi eventi si sono svolti a San Salvador, Londra e Roma. Nella città eterna, premio Nobel argentino Adolfo Perez Esquivel è stato l’oratore principale. Ha stato ricevuto in udienza da papa Francesco prima della sua apparizione all’evento. A livello internazionale, la Chiesa segna 24 marzo come Giornata di preghiera e digiuno per i missionari martiri e le Nazioni Unite come Giornata Internazionale del Diritto alla Verità per quanto riguarda gravi violazioni dei diritti umani. Infine, su questo blog, abbiamo adottato «Romero per l’Anno della fede», come il nostro motto e abbiamo ampliato la nostra copertura per cercare di tenere il passo con la rapida notizie canonizzazione. In particolare, abbiamo implementato una politica di tre lingue e pubblichiamo in inglese, spagnolo e italiano da Pentecoste, nel tentativo di rendere i contenuti del blog a disposizione di una grande fetta del mondo cattolico. Altre pietre miliari incluse nuove alleanze, sforzi di distribuzione e di promozione, e 100.000 pagine viste. Si deve aspettare nuovi progetti del prossimo anno, tra cui un problema saremo tutti troppo felici di avere per un blog beatificazione: la vita dopo la beatificazione! Archbishop Óscar A. Romero of El Salvador was even more succinct in his formulation: “the Christ of Bethlehem is the divine summation of my entire Gospel preaching,” said Romero. [«Orientación» Weekly, December 25, 1977.] Explaining in more detail, Romero states that, “based on Bethlehem Christians can no longer invent another Christ or another liberating doctrine apart from the authentic Gospel: the Gospel of poverty and austerity, detachment and obedience to the will of the Father, of humility and of the path to the beatitudes and to the cross.” Id. From poverty and humility to the cross, there is only one step, announced Ab. Romero: the rejection of a world not ready to accept the scandal of a lowly, humble Lord and God. “Like Christ the Church grows during the darkness of night. The Gospel of Saint John says: ‘He came into the world but the world did not know him’,” preached Romero. Archbishop Romero reminds us that the poor draw us closer to Christmas and to God. Es auténticamente un artículo de fe que la pobreza es un elemento central en la teología de la Navidad. El Catecismo de la Iglesia Católica así lo proclama: “Jesús, desde el pesebre hasta la cruz comparte la vida de los pobres”. [Compendio del Catecismo de la Iglesia Católica 544.] El Beato Juan Pablo II reiteró esa doctrina, predicando que, “Cristo que, siendo rico se hizo pobre libremente, nació en la pobreza de un pesebre, anunció la liberación a los pobres, se identificó con los humildes, los hizo sus discípulos y les prometió su reino”. Benedicto XVI ha señalado el hecho de que Jesús nació entre una familia humilde rodeada por “pobres y anónimos pastores... Los pequeños, los pobres en espíritu: éstos son los protagonistas de la Navidad, tanto ayer como hoy”. El Papa Francisco nos interpreta la implicación de ese hecho: “significa que para ser como Él, no debemos ponernos por encima de los otros, sino más bien abajarnos, ponernos al servicio, hacernos pequeños con los pequeños y pobres con los pobres”. Para evitar ese desconocimiento, esa falta de comprensión, Mons. Romero anuncia la “buena nueva” en el lenguaje más concreto y más urgente que es capaz de concebir y proclama, “Cristo no nació hace veinte siglos, Cristo está naciendo hoy en nuestro pueblo”. Lo hace para dar mayor efectividad a su advertencia: “no busquemos a Cristo entre las opulencias del mundo, entre las idolatrías de la riqueza, entre los afanes del poder, entre las intrigas de los grandes”. Hacerlo sería esfuerzo en vano: “Allí no está Dios. Busquemos a Dios con la señal de los ángeles: reclinado en un pesebre, envuelto en los pobres pañales que le pudo hacer una humilde campesina de Nazaret, unas mantillitas pobres y un poco de zacate como descanso del Dios que se ha hecho hombre, del Rey de los siglos que se hace accesible a los hombres como un pobrecito niño”. En el mundo de hoy, “habría que buscarlo entre los niños desnutridos que se han acostado esta noche sin tener que comer. Entre los pobrecitos vendedores de periódicos que dormirán arropados de diarios allá en los portales. Entre el pobrecito lustrador que tal vez se ha ganado lo necesario para llevar un regalito a su mamá, o quien sabe del vendedor de periódico que no logró vender los periódicos y recibirá una tremenda reprimenda de su padrastro o de su madrastra”. En una famosa frase, ampliamente difundida, Mons. Romero predicaba que, “nadie podrá celebrar la Navidad auténtica si no es pobre de verdad”. Aplicando la doctrina social a lo que dice el Catequismo, Monseñor explicaba que, “Los autosuficientes, los orgullosos, los que desprecian a los demás porque todo lo tienen, los que no necesitan ni de Dios, para esos no habrá Navidad. Sólo los pobres, los hambrientos, los que tienen necesidad de que alguien venga por ellos tendrán a ese alguien, y ese alguien es Dios, Emmanuel, Dios con Nosotros”. Y en palabras aferradas al sentido común, explicaba, “No se puede desear comer cuando no se tiene hambre, no se puede tener necesidad de Dios cuando se es orgulloso, autosuficiente. Sólo los pobres, sólo los que tienen hambre serán saciados”. Una bienaventuranza navideña: “Dichosos los que ven venir la Navidad como el hambriento ve venir algo que comer. No se puede anhelar la liberación, la libertad, si no se tiene conciencia de estar esclavizado”. Cuando el Papa Benedicto XVI inauguró en el año 2009 un almuerzo navideño con los pobres, reconociendo esta importante nota de la doctrina social en la Navidad, el pontífice comentó, “He venido a estar entre vosotros precisamente en la fiesta de la Sagrada Familia, porque, en cierto sentido, se parece a vosotros”. Palabras del papa emérito que hacen recordar lo que dijo Monseñor Romero treinta años atrás: “Como nos parecemos a Jesús en Belén esta noche los salvadoreños cuando tenemos una sociedad que se puede presentar como la pobreza acabada del Belén de María, de José y de Jesús”. Monseñor Romero nos recuerda que a través de los pobres nos acercamos a la Navidad y a Dios. E ‘veramente un articolo di fede che la povertà è fondamentale per la teologia del Natale. Il Catechismo della Chiesa Cattolica proclama così: “Gesù condivide la vita dei poveri, dalla mangiatoia alla croce”. [Compendio del Catechismo della Chiesa Cattolica 544.] Beato Giovanni Paolo II ha ribadito questa dottrina, predicando che “Cristo che, essendo ricco si fece liberamente povero, nacque nella povertà di un presepe, annunziò la liberazione ai poveri, si identificò con gli umili e promise il suo regno”. Benedetto XVI ha sottolineato il fatto che Gesù nacque da una famiglia povera, circondata da “poveri ed anonimi pastori... piccoli, i poveri in spirito: ecco i protagonisti del Natale, ieri come oggi”. Papa Francesco spiega le implicazioni di questo fatto: “per essere simili a Lui noi non dobbiamo metterci al di sopra degli altri, ma anzi abbassarci, metterci al servizio, farci piccoli con i piccoli e poveri con i poveri”. Per evitare quest’oblio, questa mancanza di comprensione, Mons. Romero ha annunciato la “buona notizia” nel linguaggio più concreto e più urgente che è in grado di professare e proclama: “Cristo non è nato venti secoli fa, Cristo sta nascendo oggi nel nostro popolo”. Lo fa per dare maggiore efficacia al suo avvertimento: “Non cercate Cristo tra l’opulenza del mondo, l’idolatria della ricchezza, tra le preoccupazioni di potere tra gli intrighi dei grandi”. Farlo sarebbe uno sforzo inutile: “Dio non è lì. Cercate Dio con il segno degli angeli, che giace in una mangiatoia, avvolto in gli panni poveri che una contadina povera di Nazareth gli ha dato, alcune coperte poveri e un po ’di erba per il riposo del Dio si è fatto uomo, del re dei secoli che si fa accessibile agli uomini come un povero bambino”. Nel mondo di oggi, “abbiamo bisogno di cercarlo tra i bambini malnutriti che hanno dormito stanotte senza mangiare. Tra quei poveri strilloni che dormono lì nei portali, avvolti dei giornali. Tra il povero ragazzo lustrascarpe che forse ha guadagnato il danaro per portare un regalo per la sua mamma, o chissà il venditore di giornale che non è riuscito a vendere giornali e riceverà un grande rimprovero dal suo patrigno o matrigna”. In una frase famosa, ben distribuita, Romero predicava che “nessuno può celebrare un autentico Natale se non è veramente povero”. Applicando la dottrina sociale a ciò che spiega il Catechismo, Romero spiega che “Gli auto-sufficienti, gli orgogliosi, coloro che disprezzano gli altri perché hanno tutto, non hanno bisogno o Dio, non ci sarà Natale per loro. Solo i poveri, gli affamati, coloro che hanno bisogno di qualcuno a venire da loro, avranno che qualcuno, e quel qualcuno è Dio, l’Emmanuele, Dio con noi”. E aggrappato alle parole di buon senso, ha spiegato, “Non si può desiderare di mangiare quando non ha fame, non si può avere bisogno di Dio quando siete orgogliosi, autosufficiente. Solo i poveri, solo gli affamati devono essere saziati”. Una beatitudine di Natale: “Beati coloro che vedono il Natale come il affamato vede venire qualcosa da mangiare. Non si può desiderare la liberazione, la libertà, se non si ha la consapevolezza di essere schiavi”. Quando Papa Benedetto XVI ha inaugurato nel 2009 un pranzo di Natale con i poveri, riconoscendo questo importante atto della dottrina sociale a Natale, il Papa Emerito ha detto: “Sono venuto tra voi proprio nella Festa della Santa Famiglia, perché, in un certo senso, essa vi assomiglia”. Parole Papa che ricordano ciò che Romero ha detto 30 anni fa: “Come noi salvadoregni assomigliano Gesù a Betlemme stasera quando viviamo in una povertà estrema come quella del Betlemme di Maria, Giuseppe e Gesù”. Mons. Romero ci ricorda che con i poveri ci avviciniamo al Natale e al Signore. In which we look at the journey of Faith on the canonization superhighway. Not for the person being canonized, but for his followers—and not on the storied “fast track.” Canonization is a legal proceeding with your hero on trial, and although you expect that, like George Bailey in “It’s A Wonderful Life,” he will earn his wings (or halo), it can be a weary, soul-testing and sometimes dispiriting process. For exactly this reason, Pope Francis’ advice for the followers of Archbishop Óscar A. Romero of El Salvador seemed so insightful. He said we “must have faith that the canonization of Archbishop Romero is proceeding at an appropriate speed.” Faith. That’s exactly what you need. Lots of it. Imagine the person you admire the most, who preaches love and holiness, is slandered, vilely accused, and based on those smears, unjustly murdered. Even after his death, some continue to revile him, while you hold on to a belief that, because of Faith, he will be justified, redeemed, vindicated. That process should sound very familiar. In a sense, it’s a metaphor for the Christian history of salvation. Jesus came, preached, was rejected by the world, was accused of political insubordination and executed, but we believe that He did not die and will return in glory. Although this piece is about Archbishop Romero, it applies to the causes of many saints. And, although this piece deals with canonization, its lessons can apply to many of the Church’s processes, which can be seen through the lens of politics and palace intrigue, but we must trust that they are guided by the Holy Spirit. Alright, let’s hop on the time machine. It’s Sunday, March 12, 1983, less than three years after Archbishop Romero’s assassination. I live in New York, in a crowded two bedroom apartment with my parents and three brothers. I’m keeping a diary (no blog yet!). In my last entry that evening, I write: “I believe I have been in the presence of a saint when I have been in the presence of Archbishop Romero.” That’s it. That’s the moment I knew it. I was 14 years-old at the time. I did not understand the process, or the requirements for beatification and canonization. In fact, I wasn’t even thinking that Romero was a martyr—I didn’t really grasp the concept of martyrdom. So, I wasn’t thinking that he was a saint because he had been killed in hatred of the faith, or because he had been killed at all. I just fervently believed that he was a saint because I had met him when I was a boy growing up in El Salvador and he came across that way. I had attended his Masses, had been confessed by him. I was a witness to his holiness. Alright, fast forward a couple of years. It’s winter 1985. I’m still living in New York, but in a different tenement. I have found a book, “The Word Remains: A Life of Oscar Romero,” by Fr. James Brockman. But we are poor and I do not yet know the luxury of buying books at this point in my life. So, I have to go to the library to read it. The closest one with a copy is a distant branch of the New York Public Library. I have to take two buses to get there. But, I go there on Saturdays for several months, taking the journey to read and re-read Fr. Brockman’s book. I remember waiting for the bus. It was so cold that my toes would hurt from the exposure, and I was glad when they went numb. What was I doing? What was driving me to make this trip? The answer is that at the end of my journey, I would have an encounter with holiness, an encounter with Archbishop Romero. Later, I had the audacity to write a letter to Fr. Brockman, addressed to the book’s publisher (no Google to search for his address). To my delight, some months later, a letter came back from Fr. Brockman, with whom I was able to exchange correspondence about Romero. Gingerly, I broached the subject with Fr. Brockman, of whether Romero could ever be declared a saint. He was unsure, but he told me that he believed Romero was a model of holiness. It’s now March 1988; a sunny day in Boston. During college, I am in Harvard Sq., walking toward an address I have found in a newspaper listing, for a gathering to honor Archbishop Romero. I find the place, right off the square. It’s small. Perhaps I expected some big meeting hall. This place looks like some hole-in-the-wall bookshop. Plus, I don’t see anything that seems appropriate for the remembrance of an archbishop. No candles, no crosses, nothing remotely religious or sacred. Immediately, red flags go up when I spot, well, red flags. There are communist symbols, pamphlets, materials in support of the Marxist rebels fighting in El Salvador. I draw no closer. Instead, I turn around and walk away, disenchanted. I have not found holiness at the end of this outing; I have not found Archbishop Romero. God is not in the flurry, the fire, or the earthquake. (1 Kings 19:11-12.) This is what I will find time and time again in the next couple of decades: distortion and manipulation of Archbishop Romero’s message by those who wish to use it to serve their own political ends. It is very disappointing and disheartening. Forward one more year. It’s August 25, 1989. I am in Manhattan with my best friend, a Baptist African-American kid who shares my spiritual hunger and whom I am drawing into the Catholic Church. Five years earlier, the same year I wrote in my diary that Romero was a saint, I had dragged this same friend to St. Patrick’s Cathedral to pay our respects to another fallen archbishop, New York’s own Cardinal Cooke. But this time, in ‘89, we were in Manhattan on a more joyous note. We were there for the premiere of the Paulist Pictures movie “Romero,” starring Raul Julia as the archbishop. A decade after I had last seen my childhood hero, I would see him again, on the big screen. It was uplifting, at a time when my spirit needed uplifting. El Salvador was in the midst of its civil war, and I was constantly hearing depressing news from home. Salvadoran refugees were pouring out of the country to flee the horrors of war. The movie contained a positive message of valor and holiness amidst this, a glimmer of Hope. One year forward. August 1990. I am in back in El Salvador, for the first time since leaving the country. It’s not under optimal circumstances; I am there because my grandmother, who raised me as a child, has passed away. 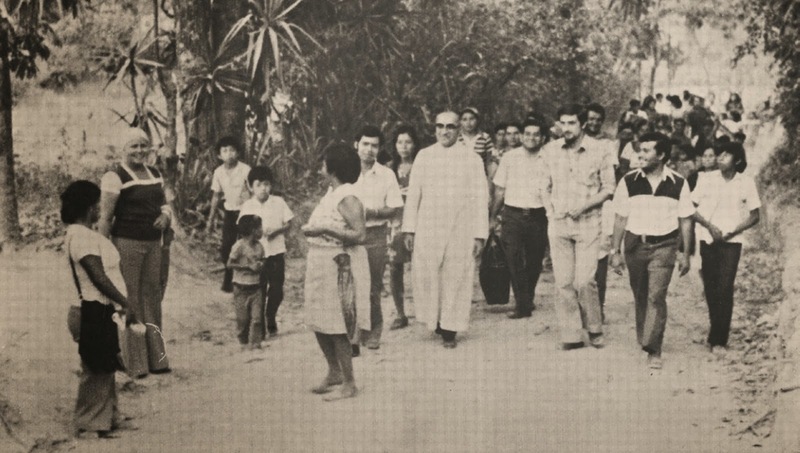 But, at the end of this journey, I find Archbishop Romero. His likeness is in a big picture on the wall of my grandmother’s bedroom. I also make time to visit Archbishop Romero’s grave at the Cathedral. The place is mobbed by faithful, praying for miracles. As I knew it as a child, the poor know that Romero is a saint before the theologians have confirmed it, and despite the fact that the dictators dispute it. The tomb is strewn with plaques thanking Archbishop Romero for favors granted. Now, fast forward one whole decade. I am back in El Salvador in March 2000 to commemorate the 20th anniversary of Archbishop Romero’s death. I’m not alone. Between 100,000 - 500,000 people crowd the square in front of the Cathedral to honor Romero. The atmosphere is festive. There is music and fireworks. By now, the war is over, the country is at peace. There are still many who whisper that Romero was a communist—the now standard slander against him. 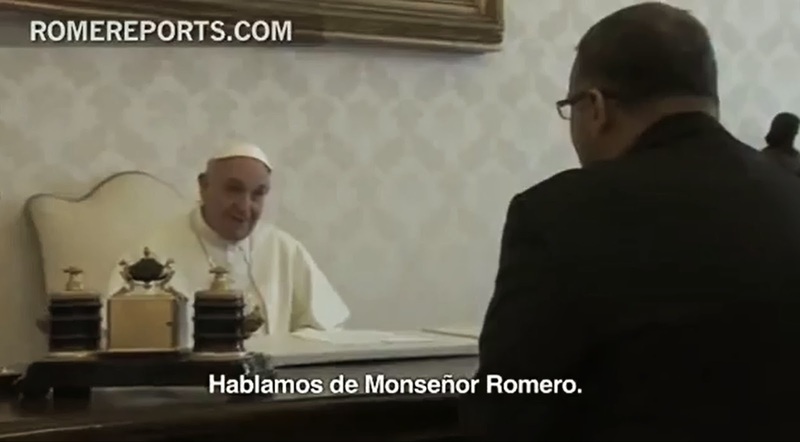 But I am happy to find kindred spirits—not just political agitators, but people who admire Romero for his holiness. This camaraderie attests to our Faith (John 13:35). Also—and this is icing—I find that audio recordings and even videos of Romero are popping up on the Internet. I have not heard Romero’s voice at all in 20 years, but it has been resounding in my head all this time, and now I can hear his voice outside my head, also.